STAY 4 NIGHTS AND WE WILL WAIVE THE CLEANING FEE! 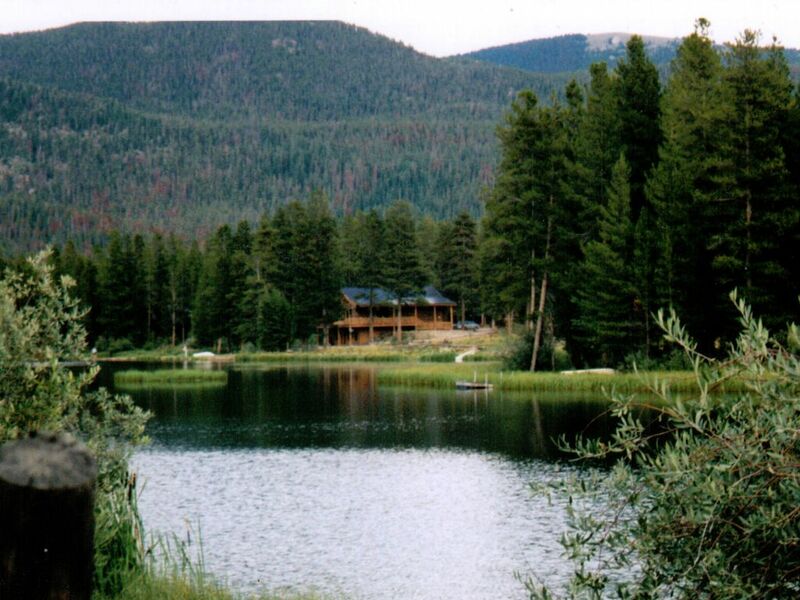 This gorgeous Sun Valley Lakefront home is located right by the Rocky Mountain National Park. Bring your kayaks and hiking boots! Beautiful 3 bedroom/3 bath home sleeps up to 10 comfortably. Upstairs master bedroom has king size bed, downstairs bedrooms have 1 queen bedroom and one bedroom featuring a bunk bed with double below and single on top and another double bed. This home also provides a single foldaway bed. Big, open great room on the first level with a gourmet kitchen with gas stove and double oven and a large dining area will offer wonderful family friendly evenings to make some very special memories. Enjoy cool nights by the Kiva fireplace. Lower living room offers even more space to spread out, relax and watch TV. Fabulous deck to take in the views of the lake and the mountains. You will never want to leave this family friendly and incredible home. This home offers free WiFi as well as cable. Conveniently located 5 minutes from Grand Lake! FIVE NIGHT MINIMUM OVER THE JULY 4TH HOLIDAY. Minimum Age Requirement to rent this home is 25. Beautiful cabin in a perfect location! It is super close to On the Trails Rentals! The layout of the home is great for family time. The kitchen is a good size for preparing large meals. The only things we really noticed that would make this place absolute perfection are: 1. Larger water heater. Only two five minute showers before the hot water runs out. 2. Newer mattresses. These are probably just at the end of their lifespan. 3. Deep cleaning. The house was clean. It was not nasty by any means! I would just recommend doing some spiderweb removal. We didn't see a bunch of spiders, but there were several webs that need to be removed. Overall, this is a wonderful home in a perfect location! Would stay here again! Glad you had a good stay! We look forward to your return. We stayed here with two sets of grandparents and two children under 4. It was perfect! Two living spaces plus two deck areas gave us enough room to spread out too. The view was gorgeous too. We loved sitting outside and watching the scenery. Hope to come back again soon! Sounds like you had a great vacation. We hope to see you again soon too! Perfect for a long weekend getaway! We were so excited when we walked into the cabin! We reserved this space for a group of friends, and everyone had the same reaction. The location was great and the views were breathtaking! Everything was wonderful except the Master bedroom bed. Mattress needs replaced. For a family getaway for three couples, this 3 bedroom, 3 and half bath log cabin was perfect. It was very clean, and in a gorgeous location with deck overlooking the lake. Kitchen was great and we ate almost all meals in. Could not have been happier with this rental and hope we will be able to return some day. Please note: The above listed rates are averages based on different lodging specials which change throughout the year. These nightly rates may change slightly depending on your length of stay. To get an accurate rate and total price for your stay please refer to the “Get an Instant Quote” tab to the right of the screen or contact us at (970) 627-1131 or info@grandmountainrentals.com .